Casino Pop – Lucky Wednesday Challenge! Have a blast this summer! OPT-IN on the promotion page! Claim the last Summer Blast rewards! It has been indeed a blast throughout August 2017 at Casino Pop. All players were able to enjoy daily treats and rewards from Monday to Friday every week throughout the month, courtesy of their Summer Blast campaign. As the month is drawing to its end, we have some last tasty treats left such as today’s Lucky Wednesday Challenge. Wager on Book of Dead to instantly receive a Free Spins reward. Not popped into Casino Pop yet? Then sign-up now and choose one of two options for their welcome package, either a very large deposit bonus + Free Spins or multiple welcome bonuses for the first 4 deposits. Do not miss the last three days of the Casino Pop Summer Blast. It has been an exciting and hot summer where every week was filled with awesome specials that will reward all those players stopping by on a hot summer day. Free Spins, Epic Spins, generous bonuses, tournaments, challenges and one day per week a surprise offer will make for great gaming throughout the next seven weeks. 30th August 2017: Wager minimum €30 on Book of Dead and receive instantly 40 Free Spins on the same game. Offer is available until 23:59 CET. Standard wagering requirements apply for the winnings from the Free Spins. Extra Level-up reward: Throughout the campaign, all players leveling up on the progress bar will be rewarded with extra Free Spins and on every 10th level with Epic Spins. Launched in 2016, the casino is operated on the MT SecureTrade / iGamingCloud platform under MGA Malta and UKGC licenses. On offer on desktop, mobile and tablet are 1,000+ games from Netent, Microgaming, NYX Interactive (BetDigital, Elk Studios, NextGen Gaming, Thunderkick), Play’n GO, Quickspin, Scientific Games (Bally, Barcrest, WMS) and Yggdrasil. The Live Casino tables are powered by Netent Live. Customer Support at CasinoPop is available 24/7 via Email or Live Chat. You can read our full casino review here. Casino Pop – Christmas Calendar 2018 | Final Days! Casino Pop – February Pop Treats! 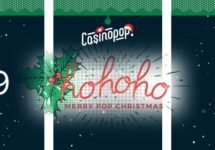 Casino Pop – The Perfect Bet!